Hearing loss from neurofibromatosis type 2 (NF2) is sensorineural hearing loss, hearing loss caused by damage to either the inner ear, or the nerve from the ear to the brain. 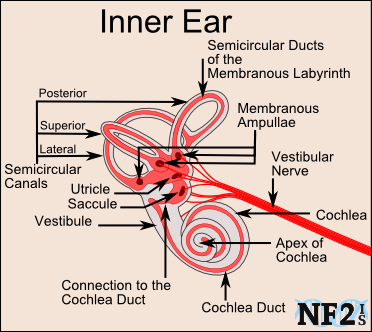 Hearing loss from (NF2) is hearing loss caused by damage to the nerve from the ear to the brain. Damage to hearing and balance is from a tumor called vestibular schwannoma (VS)/acoustic neuroma. 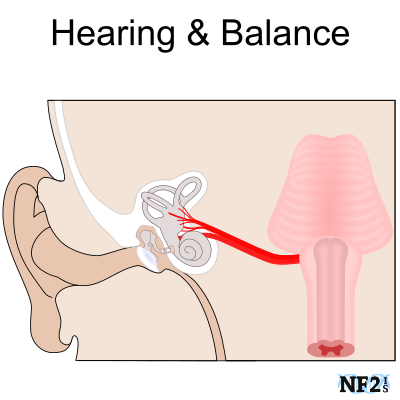 Hearing loss from NF2 is not damage from sound-induced, or other damage to the eardrum. Individuals with the NF2 genetic condition have a ninety-five to ninty-eight percent (95% - 98%) risk of development of tumors to damage hearing in both ears. Individuals with NF2 commonly develop tumors on other nerves in the brain and along the spinal cord. A sign of development of hearing loss is tinnitus. 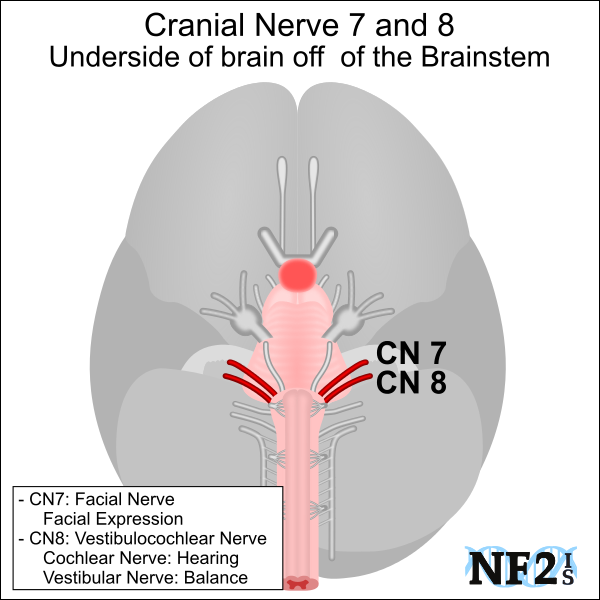 Cranial nerve 8 (CN8), is the vestibulocochlear nerve. As is the case with all cranial nerves there are two. One branch from out the left side of the brain stem (region cranial nerves start, from medulla oblongata and pons) and one on the right side of the brainstem. After a short distance from the brainstem, the vestibulocochlear nerve splits to become the vestibular nerve, balance nerve, and the cochlear nerve (acoustic nerve), the hearing nerve, as it extends towards the inner ear. Loss of function on CN8 for one side of the head would leave an individual with single-sided deafness (SSD) and some balance issues. The loss of function of the left and right of the vestibular nerve will result in severe balance issues. A battle everyone born with neurofibromatosis type 2 (NF2) is likely to face, some earlier than others, is growth and issues of some level from one vestibular schwannoma (VS), on one side of the brain, or bilateral vestibular schwannoma (bilateral VS). NF2 does not always result in other tumors in the; brain, spinal cord and potentially other parts of the body. Bilateral VS is a fairly common issue consistent with individuals having inherited NF2. When these VS may start to grow, and the rate of growth, is primarily dependent on an individual's exact NF2 mutation, but individual environment variables may increase the growth rate. Reason for growth other than genetics is a topic for debate by researchers. Vestibular Schwannoma (VS) is sometimes also referred to as acoustic neuroma (AN). Tumor names like a vestibular schwannoma (VS) is a combination of tumor location and type, with vestibular as the nerve the tumor is growing, and schwannoma is the type of tumor. Important to Note: Tumor growth can cause damage to the vestibular nerve branch and potentially not damage the cochlear nerve. Vestibular nerves damage can only result in balance issues, requiring the use of a cane or walker to walk, and wheelchair under extreme circumstances. Walking can improve on its own in time, with good results from vestibular rehabilitation therapy (VRT). Also, individuals with NF2 and bilateral vestibular nerve damage will stand and take their first steps again after bilateral damage (left and right). Unfortunately, it seems to take a little longer for people who develop VS but do not have NF2. When a person is born with the NF2 condition, they have either a missing or broken tumor suppressor gene called NF2 in some or all of their body. As a result, they cannot make the protein MERLIN (Moesin-Ezrin-Radixin-Like Protein) which can cause tumor growth, particularly vestibular schwannoma (VS). Up to ninety-nine percent (99%) of people with NF2 will develop bilateral VS. It is important to understand that the growth of a VS. Size of the tumor is not the determining factor of deafness in an ear. Tumors can stop growing for long periods of time in years before continuing to grow again, tumor-drug treatments may offer additional delays, and even after there are hearing implants to allow for hearing after complete nerve damage. VS are very common tumors to grow, the majority of people who develop them do not have NF2 and are the result of spontaneous tumor growth. There are two different growth patterns of these massed, what we will call 1) typical and 2) multi-lobular. The typical VS is simply an overgrowth of a schwann cell inside the nerve cell. The multi-lobular seems to be a cluster of schwann cells, which NF2 surgeons should check at the tumor mass if the VS has an appearance of a bundle of grapes before surgery. The surgical course is different for tumor masses that are typical and then when tumors are multi-lobular. Multi-lobular masses might be from one nerve or a combination from the; cochlear, vestibular, and facial nerve fibers. 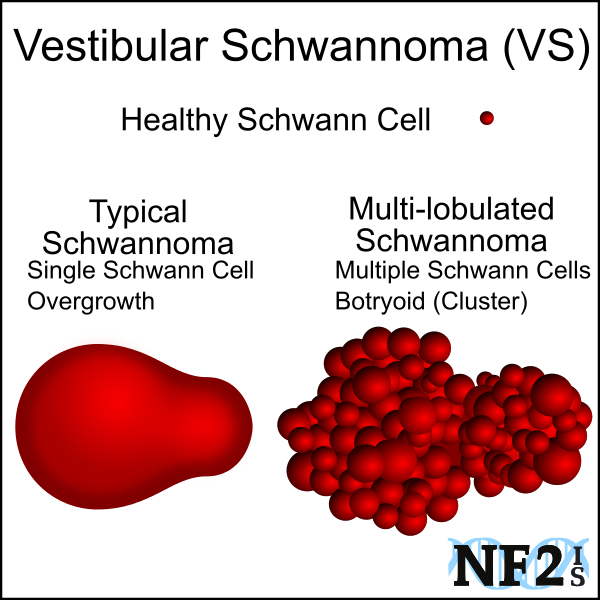 An individual with VS but does not have NF2 would likely be just a typical, one schwann cell overgrowth. An individual with NF2 can have growth of either type. Possible growth of multi-lobular tumor masses is important information for doctors who do surgery resection, or radiation treatments should know. The possible risk means individuals with NF2 require MRI or CT scans with clear imaging and possibly added imaging than necessary for individuals with spontaneous schwannoma for ideal treatment. Tinnitus is a phantom sound people start to hear when hearing loss develops. Once it starts, it does not go completely away, even if a person experiences complete hearing loss. However, things can be done to make it manageable or worse. For people with NF2, sudden development of random tinnitus is an indicator that the cochlear nerve has some level of damage. Hearing loss in the general population; is frequently a result of rupturing the eardrum or one of the three tiny bones and easily corrected with sound amplification or a cochlear implant. 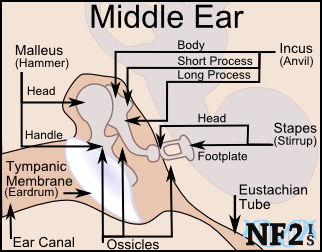 Damage to the middle ear is not the reason for hearing loss for NF2. CN8 - Vestibulocochlear Nerve: As this vestibulocochlear nerve leaves the center of the brain it splits in half to become the vestibular nerve and the cochlear nerve. Cochlear Nerve: The cochlear nerve (auditory nerve), branches off of CN8, goes to the cochlea (spinal ganglion) and is the nerve specifically for hearing. 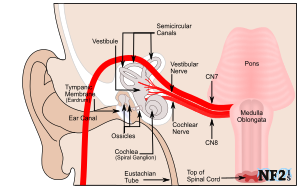 Vestibular Nerve: This nerve branches off of CN8, connects the vestibule and the semicircular canals; function is balance and orientation. Membranous Ampulla (Balance Glands): Body movement is sent through the posterior, superior and lateral canals semicircular canals into the ampullae glands at the end of each canal; information to the vestibular nerve. Vestibular schwannoma can also damage cranial nerve 7, the facial nerve, due to the proximity of the vestibular nerve. Both nerves extend from the brain stem, the center of the brain, very close to each other and as they extend to the side of the head damage to one can easily result in damage to the other. For individuals with NF2, medical treatments are often necessary because even benign (noncancerous) tumors are life-threatening in size. Treatment is sometimes necessary for quality of life (QOL), for the prevention of hearing loss or facial nerve function. Since there is currently no treatment to destroy all tumors developed as a result of NF2, medical treatment is only a matter of tumor management. The facial nerve can easily be broken or otherwise weakened, during treatment management of VS. There are different treatment techniques for different approaches to remove or manage tumors based on tumor; 1) location, 2) size, 3) shape, 4) rate of growth, 5) age, 6) weight, and 7) general health. Treatments might include different; 1) surgical approaches for removal or debulking (partial removal) of a tumor or bone, 2) of radiation treatment or 3) tumor drug treatment. Learn more about Facial Nerve Damage and Options. The only tumor management for NF2 is the treatment of one tumor at a time. Regardless of treatment, tumors can form on the same nerve after treatment, the tumor radiated is at higher risk of continued growing again a few years later. Microsurgery is the only way to stop a tumor from further damage completely, but a new one can grow back on the same area of the nerve. There are different surgical approaches for VS that increase and decrease the odds of some of the risks. Radiosurgery or Radiation Therapy works on some people and some tumors but can take months to know for certain if it works and can result in the delay of valuable time. While there could be other side effects including tumor swelling shortly after treatment before a tumor might stop growing or shrink, it is the easiest treatment to recover from short-term and if it works can stop the growth of a tumor for many years. Medications that are target tumor drug treatments have been in trials for some time, but none has been proven to be 100% effective on shrinking or stopping growth in everyone with NF2. New treatments are in development. Due to these treatments, many people are finding themselves able to manage to hear with a cochlear implant (CI) for increasingly longer periods of times. Cochlear devices are hearing implants like the auditory brainstem implant (ABI) can aid in hearing loss when all else fails, there is more than one cochlear devices that might be of help as well and sound amplification options that can aid in even better sound with these devices. It is important to know the advantages and disadvantages of all of the NF2 tumor management options available for informed medical decisions. While the most effective treatments to date are surgical and radiation, one of the problems with both microsurgery to remove a tumor and radiation to stop growth is that they often damage the facial nerve, clinical trials are underway for different tumor cytostatic or cytotoxic agents that can prevent or delay the need for either treatment for some time. 'NF2 Information and Services' pages are meant to be shared with doctors and others with NF2 in hopes with information for options to discuss during doctors and to help more people. Ardern-Holmes, Simone, Gemma Fisher, and Kathryn North. "Neurofibromatosis Type 2: Presentation, Major Complications, and Management, With a Focus on the Pediatric Age Group." Journal of Child Neurology 32.1 (2017): 9-22. Bosch, Martina M. "Ophthalmologic findings and long-term course in patients with neurofibromatosis type 2." American journal of ophthalmology 141.6 (2006): 1068-1077. Dewan, Ramita "Evidence of polyclonality in neurofibromatosis type 2-associated multilobulated vestibular schwannomas." Neuro-oncology 17.4 (2014): 566-573. "Vestibular Schwannoma (Acoustic Neuroma) and Neurofibromatosis"